This article is about a phenomenon in economics. For the neologism, see Korean Wave. In economics, Kondratiev waves (also called supercycles, great surges, long waves, K-waves or the long economic cycle) are hypothesized cycle-like phenomena in the modern world economy. It is stated that the period of a wave ranges from forty to sixty years, the cycles consist of alternating intervals of high sectoral growth and intervals of relatively slow growth. Long wave theory is not accepted by most academic economists. Among economists who accept it, there is a lack of agreement about both the cause of the waves and the start and end years of particular waves. Among critics of the theory, the general consensus is that it involves recognizing patterns that may not exist. The Soviet economist Nikolai Kondratiev (also written Kondratieff or Kondratyev) was the first to bring these observations to international attention in his book The Major Economic Cycles (1925) alongside other works written in the same decade. In 1939, Joseph Schumpeter suggested naming the cycles "Kondratieff waves" in his honor. Two Dutch economists, Jacob van Gelderen and Salomon de Wolff, had previously argued for the existence of 50- to 60-year cycles in 1913 and 1924, respectively. Since the inception of the theory, various studies have expanded the range of possible cycles, finding longer or shorter cycles in the data. The Marxist scholar Ernest Mandel revived interest in long-wave theory with his 1964 essay predicting the end of the long boom after five years and in his Alfred Marshall lectures in 1979. However, in Mandel's theory there are no long "cycles", only distinct epochs of faster and slower growth spanning 20–25 years. In 1990, William Thompson at Indiana University has published influential papers and books documenting eighteen K-Waves dating back to 930 AD in China's Song Province; and Michael Snyder wrote: "It should be noted that economic cycle theories have enabled some analysts to correctly predict the timing of recessions, stock market peaks and stock market crashes over the past couple of decades". The historian Eric Hobsbawm also wrote of the theory: "That good predictions have proved possible on the basis of Kondratiev Long Waves—this is not very common in economics—has convinced many historians and even some economists that there is something in them, even if we don't know what". Kondratiev identified three phases in the cycle, namely expansion, stagnation and recession. More common today is the division into four periods with a turning point (collapse) between the first and second phases. 1790–1849, with a turning point in 1815. 1850–1896, with a turning point in 1873. Kondratiev supposed that in 1896 a new cycle had started. The long cycle supposedly affects all sectors of an economy. Kondratiev focused on prices and interest rates, seeing the ascendant phase as characterized by an increase in prices and low interest rates while the other phase consists of a decrease in prices and high interest rates. Subsequent analysis concentrated on output. Understanding the cause and effect of Kondratiev waves is a useful academic discussion and tool. Kondratiev Waves present both causes and effects of common recurring events in capitalistic economies throughout history. Although Kondratiev himself made little differentiation between cause and effect, obvious points emerge intuitively. The causes documented by Kondratiev waves, primarily include inequity, opportunity and social freedoms; although very often, much more discussion is made of the notable effects of these causes as well. Effects are both good and bad and include, to name just a few, technological advance, birthrates and revolutions/populism—and revolution's contributing causes which can include racism, religious or political intolerance, failed-freedoms and opportunity, incarceration rates, terrorism and similar. When inequity is low and opportunity is easily available, peaceful, moral decisions are preferred and Aristotle's "Good Life" is possible (Americans call the good life "the American Dream"). Opportunity created the simple inspiration and genius for the Mayflower Compact for one example. Post-World War II and 1840's post-California gold rush bonanza were times of great opportunity, low inequity and this resulted in unprecedented technological industrial advance too. Alternatively, when the 1893's global economic panics were not met with sufficient wealth-distributing government policies internationally, a dozen major revolutions resulted—perhaps also creating an effect we now call World War I. Few would argue that World War II also began in response to failed attempts at creating economic opportunity-supporting government policy during the Great Depression of 1929 and the World War I's Treaty of Versailles. According to the innovation theory, these waves arise from the bunching of basic innovations that launch technological revolutions that in turn create leading industrial or commercial sectors. Kondratiev's ideas were taken up by Joseph Schumpeter in the 1930s. The theory hypothesized the existence of very long-run macroeconomic and price cycles, originally estimated to last 50–54 years. In recent decades there has been considerable progress in historical economics and the history of technology, and numerous investigations of the relationship between technological innovation and economic cycles. Some of the works involving long cycle research and technology include Mensch (1979), Tylecote (1991), the International Institute for Applied Systems Analysis (IIASA) (Marchetti, Ayres), Freeman and Louçã (2001), Andrey Korotayev and Carlota Perez. Perez (2002) places the phases on a logistic or S curve, with the following labels: the beginning of a technological era as irruption, the ascent as frenzy, the rapid build out as synergy and the completion as maturity. Because people have fairly typical spending patterns through their life cycle, such as spending on schooling, marriage, first car purchase, first home purchase, upgrade home purchase, maximum earnings period, maximum retirement savings and retirement, demographic anomalies such as baby booms and busts exert a rather predictable influence on the economy over a long time period. Harry Dent has written extensively on demographics and economic cycles. Tylecote (1991) devoted a chapter to demographics and the long cycle. Georgists such as Mason Gaffney, Fred Foldvary and Fred Harrison argue that land speculation is the driving force behind the boom and bust cycle. Land is a finite resource which is necessary for all production and they claim that because exclusive usage rights are traded around, this creates speculative bubbles which can be exacerbated by overzealous borrowing and lending. As early as 1997, a number of Georgists predicted that the next crash would come in 2008. Debt deflation is a theory of economic cycles which holds that recessions and depressions are due to the overall level of debt shrinking (deflating). Hence, the credit cycle is the cause of the economic cycle. The theory was developed by Irving Fisher following the Wall Street Crash of 1929 and the ensuing Great Depression. Debt deflation was largely ignored in favor of the ideas of John Maynard Keynes in Keynesian economics, but it has enjoyed a resurgence of interest since the 1980s, both in mainstream economics and in the heterodox school of post-Keynesian economics and has subsequently been developed by such post-Keynesian economists as Hyman Minsky and Steve Keen. Inequity appears to be the most obvious driver of Kondratiev waves, and yet some researches have presented a technological and credit cycle explanation as well. There are several modern timing versions of the cycle although most are based on either of two causes: one on technology and the other on the credit cycle. Additionally, there are several versions of the technological cycles and they are best interpreted using diffusion curves of leading industries. For example, railways only started in the 1830s, with steady growth for the next 45 years. It was after Bessemer steel was introduced that railroads had their highest growth rates. However, this period is usually labeled the age of steel. Measured by value added, the leading industry in the U.S. from 1880 to 1920 was machinery, followed by iron and steel. Any influence of technology during the cycle that began in the Industrial Revolution pertains mainly to England. The U.S. was a commodity producer and was more influenced by agricultural commodity prices. There was a commodity price cycle based on increasing consumption causing tight supplies and rising prices. That allowed new land to the west to be purchased and after four or five years to be cleared and be in production, driving down prices and causing a depression as in 1819 and 1839. By the 1850s, the U.S. was becoming industrialized. Several papers on the relationship between technology and the economy were written by researchers at the International Institute for Applied Systems Analysis (IIASA). A concise version of Kondratiev cycles can be found in the work of Robert Ayres (1989) in which he gives a historical overview of the relationships of the most significant technologies. Cesare Marchetti published on Kondretiev waves and on the diffusion of innovations. Arnulf Grübler's book (1990) gives a detailed account of the diffusion of infrastructures including canals, railroads, highways and airlines, with findings that the principal infrastructures have midpoints spaced in time corresponding to 55-year K wavelengths, with railroads and highways taking almost a century to complete. Grübler devotes a chapter to the long economic wave. In 1996, Giancarlo Pallavicini published the ratio between the long Kondratiev wave and information technology and communication. Korotayev et al. recently employed spectral analysis and claimed that it confirmed the presence of Kondratiev waves in the world GDP dynamics at an acceptable level of statistical significance. Korotayev et al. also detected shorter business cycles, dating the Kuznets to about 17 years and calling it the third harmonic of the Kondratiev, meaning that there are three Kuznets cycles per Kondratiev. Leo A. Nefiodow shows that the fifth Kondratieff ended with the global economic crisis of 2000–2003 while the new, sixth Kondratieff started simultaneously. According to Leo A. Nefiodow, the carrier of this new long cycle will be health in a holistic sense—including its physical, psychological, mental, social, ecological and spiritual aspects; the basic innovations of the sixth Kondratieff are "psychosocial health" and "biotechnology". More recently, the physicist and systems scientist Tessaleno Devezas advanced a causal model for the long wave phenomenon based on a generation-learning model and a nonlinear dynamic behaviour of information systems. In both works, a complete theory is presented containing not only the explanation for the existence of K-Waves, but also and for the first time an explanation for the timing of a K-Wave (≈60 years = two generations). Unlike Kondratieff and Schumpeter, Šmihula believed that each new cycle is shorter than its predecessor. His main stress is put on technological progress and new technologies as decisive factors of any long-time economic development. Each of these waves has its innovation phase which is described as a technological revolution and an application phase in which the number of revolutionary innovations falls and attention focuses on exploiting and extending existing innovations. As soon as an innovation or a series of innovations becomes available, it becomes more efficient to invest in its adoption, extension and use than in creating new innovations. Each wave of technological innovations can be characterized by the area in which the most revolutionary changes took place ("leading sectors"). Every wave of innovations lasts approximately until the profits from the new innovation or sector fall to the level of other, older, more traditional sectors. It is a situation when the new technology, which originally increased a capacity to utilize new sources from nature, reached its limits and it is not possible to overcome this limit without an application of another new technology. For the end of an application phase of any wave there are typical an economic crisis and stagnation. The economic crisis in 2007–2010 is a result of the coming end of the "wave of the Information and telecommunications technological revolution". Some authors have started to predict what the sixth wave might be, such as James Bradfield Moody and Bianca Nogrady who forecast that it will be driven by resource efficiency and clean technology. On the other hand, Šmihula himself considers the waves of technological innovations during the modern age (after 1600 AD) only as a part of a much longer "chain" of technological revolutions going back to the pre-modern era. It means he believes that we can find long economic cycles (analogical to Kondratiev cycles in modern economy) dependent on technological revolutions even in the Middle Ages and the Ancient era. Long wave theory is not accepted by many academic economists. However, is important for innovation-based, development and evolutionary economics. Yet, among economists who accept it there has been no formal universal agreement about the standards that should be used universally to place start and the end years for each wave. Agreement of start and end years can be +1 to 3 years for each 40- to 65-year cycle. 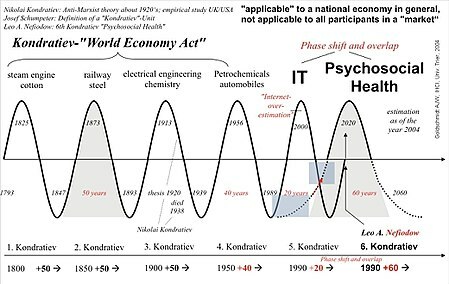 Health economist and biostatistician Andreas J. W. Goldschmidt searched for patterns and proposed that there is a phase shift and overlap of the so-called Kondratiev cycles of IT and health (shown in the figure). He argued that historical growth phases in combination with key technologies does not necessarily imply the existence of regular cycles in general. Goldschmidt is of the opinion that different fundamental innovations and their economic stimuli do not exclude each other as they mostly vary in length and their benefit is not applicable to all participants in a market. ^ a b See, e.g. Korotayev, Andrey V.; Tsirel, Sergey V. (2010). "A Spectral Analysis of World GDP Dynamics: Kondratiev Waves, Kuznets Swings, Juglar and Kitchin Cycles in Global Economic Development, and the 2008–2009 Economic Crisis". Structure and Dynamics. 4 (1): 3–57. ^ Skwarek, Shane. "Kondratieff Wave". CMT Association. Retrieved 2018-12-20. ^ Vincent Barnett, Nikolai Dmitriyevich Kondratiev, Encyclopedia of Russian History, 2004, at Encyclopedia.com. ^ Erik Buyst, Kondratiev, Nikolai (1892–1938), Encyclopedia of Modern Europe: Europe Since 1914: Encyclopedia of the Age of War and Reconstruction, Gale Publishing, January 1, 2006. ^ Thompson, William (1996). Leading sectors and world powers: the coevolution of global politics and economics. ISBN 9781570030543. ^ Snyder, Michael (2014-05-12). "If Economic Cycle Theorists Are Correct, 2015 To 2020 Will Be Pure Hell For The United States". The Economiccollapseblog.com. Retrieved December 1, 2016. ^ Hobsbawm (1999), pp. 87f. ^ "Economic causes of the first World War". Socialist Party of Britain. Retrieved 2014-08-01. ^ Korotayev, Andrey; Zinkina, Julia; Bogevolnov, Justislav (2011). "Kondratieff waves in global invention activity (1900–2008)". Technological Forecasting and Social Change. 78 (7): 1280. doi:10.1016/j.techfore.2011.02.011. ^ Perez, Carlota (2002). Technological Revolutions and Financial Capital: The Dynamics of Bubbles and Golden Ages. UK: Edward Elgar Publishing Limited. ISBN 978-1-84376-331-4. ^ Tylecote, Andrew (1991). The Long Wave in the World Economy. London: Routledge. pp. Chapter 5: Population feedback. ISBN 978-0-415-03690-0. ^ "Fred Foldvary". Foldvary.net. Retrieved 2013-03-26. ^ Minsky, Hyman (1992). "The Financial Instability Hypothesis". Jerome Levy Economics Institute Working Paper No. 74. SSRN 161024. ^ Keen, Steve (1995). "Finance and Economic Breakdown: Modelling Minsky's Financial Instability Hypothesis". Journal of Post Keynesian Economics. 17 (4): 607–635. doi:10.1080/01603477.1995.11490053. ^ See: Joseph Whitworth's quote under American system of manufacturing#Use of machinery. ^ Ayres, Robert (1989). "Technological Transformations and Long Waves" (PDF). ^ Marchetti, Cesare (1996). "Pervasive Long Waves: Is Society Cyclotymic" (PDF). Archived from the original (PDF) on 2012-07-07. ^ Marchetti, Cesare (1988). "Kondratiev Revisited-After One Cycle" (PDF). ^ Spectral analysis is a mathematical technique that is used in such fields as electrical engineering for analyzing electrical circuits and radio waves to deconstruct a complex signal to determine the main frequencies and their relative contribution. Signal analysis is usually done with equipment. Data analysis is done with special computer software. ^ Nefiodow, Leo A. (2014). "Health: The Economic Growth Engine of the 21st Century". healthmanagement.org. ^ See: Nefiodow, Leo; Nefiodow, Simone (2014): The Sixth Kondratieff. A New Long Wave in the Global Economy. Charleston 2014, ISBN 978-1-4961-4038-8. ^ Devezas, Tessaleno (2001). "The biological determinants of long-wave behavior in socioeconomic growth and development, Technological Forecasting & Social Change 68, pp. 1–57". ^ Devezas, Tessaleno; Corredine, James (2002). "The nonlinear dynamics of technoeconomic systems - An informational interpretation, Technological Forecasting and Social Change, 69, pp. 317–357". ^ Šmihula, Daniel (2009). "The waves of the technological innovations of the modern age and the present crisis as the end of the wave of the informational technological revolution". Studia Politica Slovaca. 2009 (1): 32–47. ISSN 1337-8163. ^ Moody, J. B.; Nogrady, B. (2010). The Sixth Wave: How to succeed in a resource-limited world. Sydney: Random House. ISBN 9781741668896. ^ Šmihula, Daniel (2011). "Long waves of technological innovations". Studia Politica Slovaca. 2011 (2): 50–69. ISSN 1337-8163. ^ Goldschmidt, Andreas JW; Hilbert, Josef (2009). Health Economy in Germany - Economical Field of the Future (Gesundheitswirtschaft in Deutschland - Die Zukunftsbranche). Germany: Wikom Publishing house, Wegscheid. p. 22. ISBN 978-3-9812646-0-9. Barnett, Vincent (1998). Kondratiev and the Dynamics of Economic Development. London: Macmillan. ISBN 978-0-312-21048-9. Cheung, Edward (2007) . Baby Boomers, Generation X and Social Cycles, Volume 1: North American Long-waves (PDF). Toronto: Longwave Press. ISBN 978-1-896330-00-6. Devezas, Tessaleno (2006). Kondratieff Waves, Warfare and World Security. Amsterdam: IOS Press. ISBN 978-1-58603-588-4. Freeman, Chris; Louçã, Francisco (2001). As Time Goes By. From the Industrial Revolutions to the Information Revolution. Oxford: Oxford University Press. ISBN 978-0-19-924107-1. Goldstein, Joshua (1988). Long Cycles: Prosperity and War in the Modern Age. New Haven: Yale University Press. ISBN 978-0-300-03994-8. Grinin, L.; Munck, V. C. de; Korotayev, A. (2006). History and mathematics: Analyzing and Modeling Global Development. Moscow: URSS. ISBN 978-5-484-01001-1. Hobsbawm, Eric (1999). Age of Extremes: The Short Twentieth Century 1914–1991. London: Abacus. ISBN 978-0-349-10671-7. Korotayev; Andrey, V.; Tsirel, Sergey V. (2010). "A Spectral Analysis of World GDP Dynamics: Kondratieff Waves, Kuznets Swings, Juglar and Kitchin Cycles in Global Economic Development, and the 2008–2009 Economic Crisis". Structure and Dynamics. 4 (1): 3–57. Kohler, Gernot; Chaves, Emilio José (2003). Globalization: Critical Perspectives. Hauppauge, New York: Nova Science Publishers. ISBN 978-1-59033-346-4. With contributions by Samir Amin, Christopher Chase Dunn, Andre Gunder Frank, Immanuel Wallerstein. Lewis, W. Arthur (1978). Growth and Fluctuations 1870–1913. London: Allen & Unwin. pp. 69–93. ISBN 978-0-04-300072-4. Mandel, Ernest (1964). "The Economics of Neocapitalism". The Socialist Register. Mandel, Ernest (1980). Long waves of capitalist development: the Marxist interpretation. New York: Cambridge University Press. ISBN 978-0-521-23000-1. Marchetti, Cesare (1986). "Fifty-Year Pulsation in Human Affairs, Analysis of Some Physical Indicators". Futures. 18 (3): 376–388. doi:10.1016/0016-3287(86)90020-0. Modis, Theodore (1992). Predictions: Society's Telltale Signature Reveals the Past and Forecasts the Future. New York: Simon & Schuster. ISBN 978-0-671-75917-9. Nyquist, Jeffrey (2007). "Cycles of History, Boom and Bust". San Diego: Financial Sense. Weekly Column from 11.09.2007 predicting a major turning-point between 2007 and 2009 and the start of a Great Depression. Nefiodow, Leo A. & Simone (2014). The Sixth Kondratieff. The New Long Wave of the Global Economy. Charleston. ISBN 978-1-4961-4038-8. Giancarlo, Pallavicini (1996). La teorizzazione dei cicli lunghi dell'economia, secondo Kondratiev, e l'informatica e la comunicazione. Agrigento: Accademia di Studi Mediterranei Press. Rothbard, Murray (1984). The Kondratieff Cycle: Real or Fabricated?. Ludwig von Mises Institute. Silverberg, Gerald; Verspagen, Bart (2000). Breaking the Waves: A Poisson Regression Approach to Schumpeterian Clustering of Basic Innovations. Maastricht: MERIT. Šmihula, Daniel (2009). The waves of the technological innovations of the modern age and the present crisis as the end of the wave of the informational technological revolution. Bratislava: in Studia politica Slovaca, 1/2009 SAS. pp. 32–47. ISSN 1337-8163. Šmihula, Daniel (2011). Long waves of technological innovations. Bratislava: in Studia politica Slovaca, 1/2011 SAS. pp. 50–69. ISSN 1337-8163. Solomou, Solomos (1989). Phases of Economic Growth, 1850–1973: Kondratieff Waves and Kuznets Swings. Cambridge: Cambridge University Press. ISBN 978-0-521-33457-0. Tausch, Arno; Ghymers, Christian (2007). From the 'Washington' Towards a 'Vienna Consensus'? A Quantitative Analysis on Globalization, Development and Global Governance. Hauppauge, New York: Nova Science Publishers. ISBN 978-1-60021-422-6. Tausch, Arno (2013). The Hallmarks of Crisis: A New Center-Periphery Perspective on Long Cycles. Connecticut: REPEC/IDEAS. Turchin, Peter (2006). History & Mathematics: Historical Dynamics and Development of Complex Societies. Moscow: KomKniga. ISBN 978-5-484-01002-8. The Kondratieff Wave. Dell Publishing Co. Inc. New York, N.Y., USA. 1972. p. 198. Shuman, James B.; Rosenau, David (1972). The Kondratieff Wave. The Future of America Until 1984 and Beyond. New York: Dell. This book provides the history of the many ups and downs of the economies. Tylecote, Andrew (1991). The Long Wave in the World Economy: The Current Crisis in Historical Perspective. London and New York: Routledge. "Kondratieff waves" on faculty.Washington.edu (The Evolutionary World Politics Homepage). "Kondratieff theory explained" on Kondratyev.com (Kondratyev Theory Letters).